Just thought I'd post this for those that live close. An announcement for fans of Beverly Lewis! 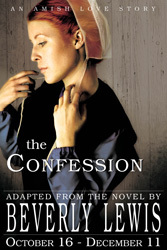 Beginning this Saturday, October 16, the Blue Gate Theater in Shipshewana, Indiana, will be featuring The Confession, a musical adapted from Beverly Lewis' books, The Shunning, The Confession, and The Reckoning! The show will run through December 11, 2010, but this Saturday, October 16, Beverly will be greeting reader-friends and signing her books before and after both the matinee and the Opening Night performance.